- 24h*7d Friendly Customer Service and Professional Technical Support. - 30-day Money Back Guaranteed. 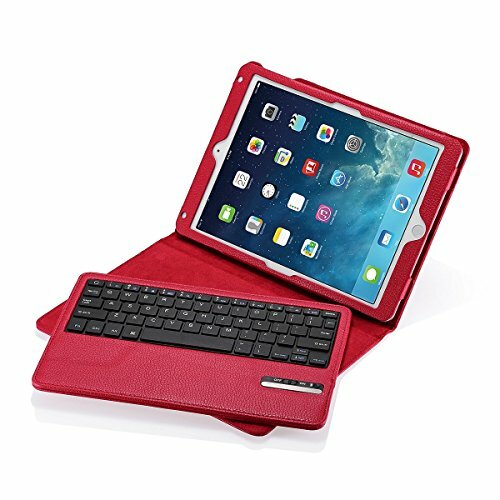 Poweradd Removable Bluetooth Keyboard Case for iPad Air / iPad Air 2. Ultra thin PU leather case and detachable keyboard combined perfectly, with the compact folding size of 10.2 * 7.1 * 1.2 inches, easy to carry on the go. - Multi-Angle Adjustable stand design ensures your hands are free while watching video, and at any angle you feel comfortable. - Energy-saving keyboard sleep mode ensures the maximum efficiency, 72 hours' continual working time on a single charge. - Bluetooth 3.0 makes the working distance up to 33-feet / 10m. - Auto Sleep / Wake Function: automatically turn your iPad Air / iPad Air 2 to sleep or wake, when the case is closed or opened. Full-body Protection: Soft & Durable PU (synthetic) leather case protects your iPad perfectly away from dirt, scratches, stains, splashes or dents. This premium vegan leather case is compact, lightweight and snug for a perfect, secure fit. Also Built-in Versatile adjustable Stand provides you a good angle for reading, typing or watching. Intelligent Automatic Feature: Automatically wake/sleep your iPad up when you opening or closing it. Intelligent connect Bluetooth keyboard when you are going to typing. The removable wireless keyboard also works with Android smartphones, iPhones, tablets, iPads or other Bluetooth-enabled devices. What You Get: 24-month Poweradd limited warranty, 30-day money back guaranteed and 24h/7d friendly customer service! Retail packaging included a 1× iPad Air/ iPad Air 2 Bluetooth keyboard, 1× Smart folio case, 1× USB charging cable, and 1× User manual.